Among those who contacted our committee was Tadhg Barry Galvin, a grand-nephew of Tadhg Barry now living in England. 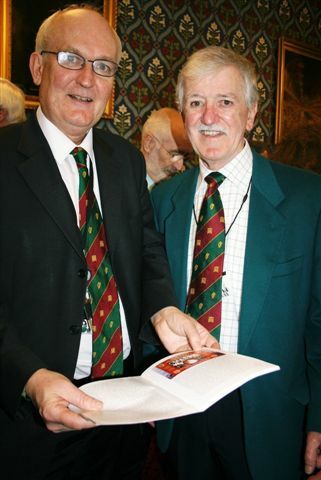 Tadhg sent us the above photo of him presenting booklet on his grand-uncle Alderman to Chris Ruane MP, Chairman of the All-Party Parliamentary group for the Irish in Britain. Also (above) a press clipping from November 22nd 1921 showing the funeral of Alderman Tadhg Barry at the Pro-Cathedral in Dublin. Mourners, led by the Lord Mayor of Dublin include TDs Michael Collins, Cathal Brugha and WT Cosgrave. 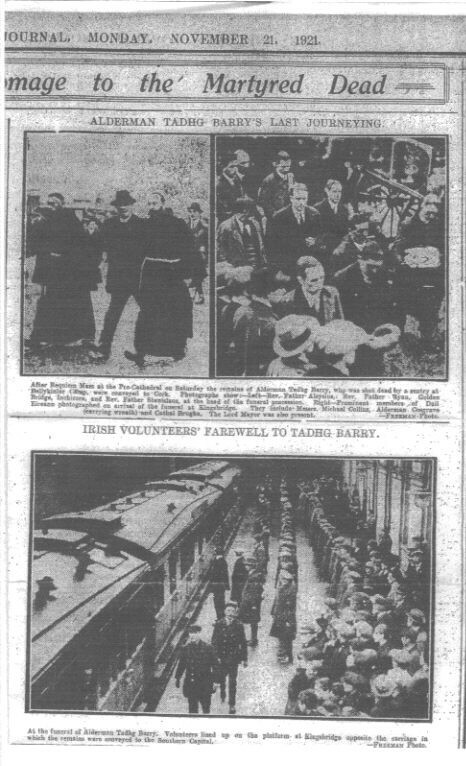 Bottom photo on cutting shows the train carrying Tadhg Barry’s remains leaving Kingsbridge (Heuston) station on its poignant voyage back to Cork. Alderman Tadhg Barry is buried in the Republican Plot St. Finbarr’s cemetery, Cork.